500g (1lb) penne salt and black pepper 45g (1½oz) butter2 large garlic cloves, crushed 250g (8oz) chestnut mushroom, sliced 300ml (½ pint ) double cream 90g (3oz) spinach, coarsely shredded 90g (3oz) blue stilton cheese, crumbled juice of ½ lemon pinch of grated nutmeg . 1- Cook the pasta quills in boiling salted water according to packet instructions. 2- Meanwhile, melt the butter in a large pan, add the garlic and mushroom, and cook for 2 minutes, stirring occasionally. Stir in the cream and boil for 2-3 minutes until the mixture reaches a coating consistency. 3- Drain the pasta, add to mushroom and cream mixture, stir well, and heat through. 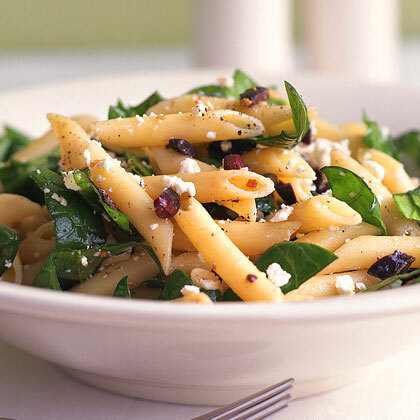 Add the spinach, Stilton cheese, lemon juice, nutmeg, and pepper to taste, and stir well to coat the pasta. Serve at once.